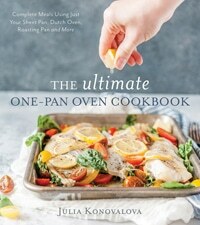 Did you PRE-ORDER my cookbook, The Ultimate One-Pan Oven Cookbook? If so, email me at julia@imagelicious.com to receive your FREE Ebook with 11 extra delicious recipes!!! Confessions time: my favourite pasta has no sauce! Yes, you read it right! My favourite way to eat pasta is to have it boiled, slathered with butter, and sprinkled with lots of melty cheese. I don’t have this kind of pasta often. In fact, I don’t remember the last time I made it. My husband looks at me funny when I fix myself a bowl of that cheesy goodness. So, to comply with what is considered to be “proper” pasta, I have been making sauces! Actually, I am lying. I used to almost never make sauces until a few months ago. We used to rely on store-bought jars of delicious tomato sauce because it was easy. I did not have to make the sauce, I did not have to stir the pots. I only had to cook the pasta and heat up the sauce. Just two pots to clean. Then things changed. I discovered the amazing way of making the sauce and pasta together in my Instant Pot. Just one pot to clean, everything cooked at the same time. Perfect! Why use Instant Pot to make pasta? Tomato sauce is super easy to heat up on the stove. Pasta is really easy to cook on the stove. Using an Electric Pressure Cooker is an overkill. 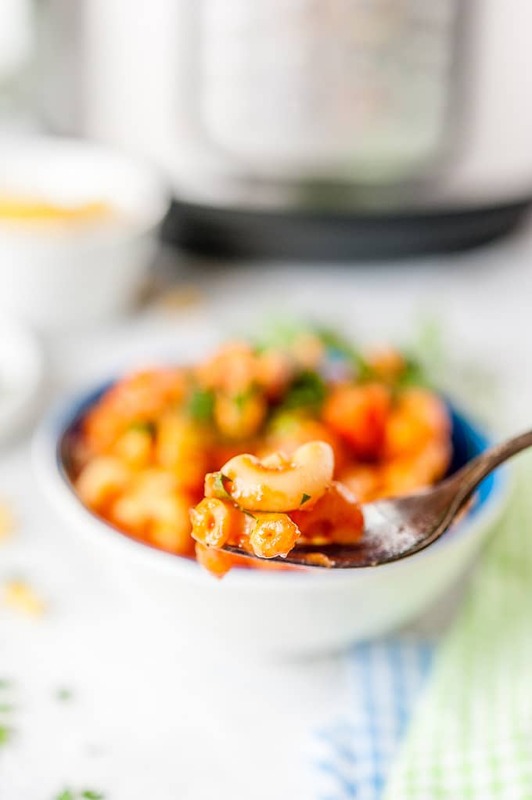 Pressure cooking pasta with tomato sauce means that there’s no need to babysit two pots and watch for pasta to not over-boil. Convenient and less cleanup. I am firmly in the second camp. What about you? Where do you stand on Instant Pot Pasta? 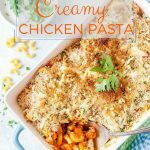 How to make Instant Pot Creamy Chicken Pasta? Oh, this is so easy! I’ve been making this Instant Pot Creamy Chicken Pasta for a few months now and it’s totally delicious and really easy. And for me, staying home with a toddler and constantly busy, it’s also very convenient. All you need to do is just combine most of the ingredients and cook at high pressure for 5 minutes! Once cooked, add some frozen veggies, shredded cheese, and let stand for a few minutes. Done! I personally like sautéing an onion in the beginning. I don’t think it takes a lot of time and it’s when I get all my other ingredients ready. But it’s an optional step. If you don’t sauté the onion, you can turn this Instant Pot recipe into a true “dump and start” recipe. 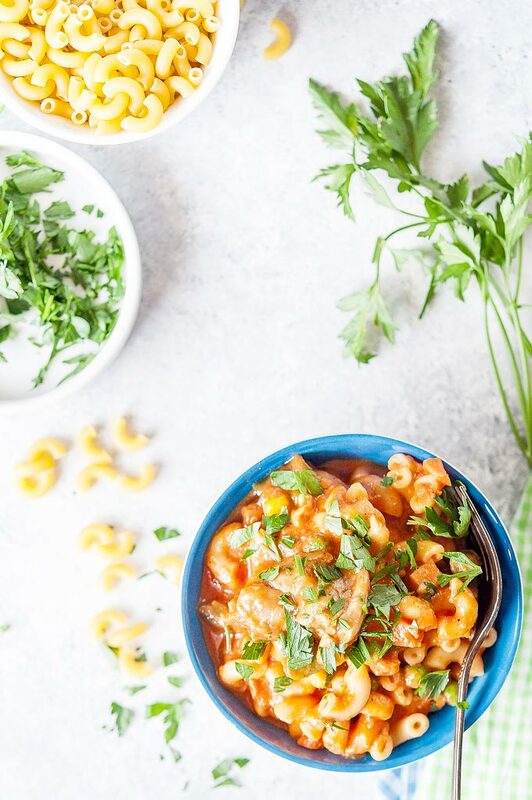 This Instant Pot Creamy Chicken Pasta is lusciously creamy with a smooth rosé sauce, crisp vegetables, and soft chicken. 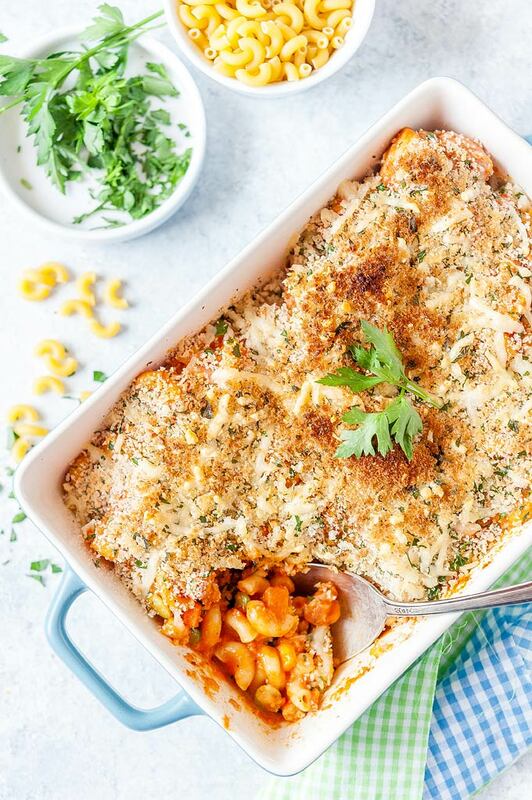 Really comforting and satisfying cozy dish. 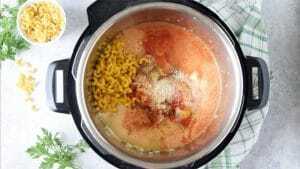 Can you make this Creamy Instant Pot Pasta vegetarian? Sure, you can!! Just omit the chicken. No need to change the cooking time. So easy! 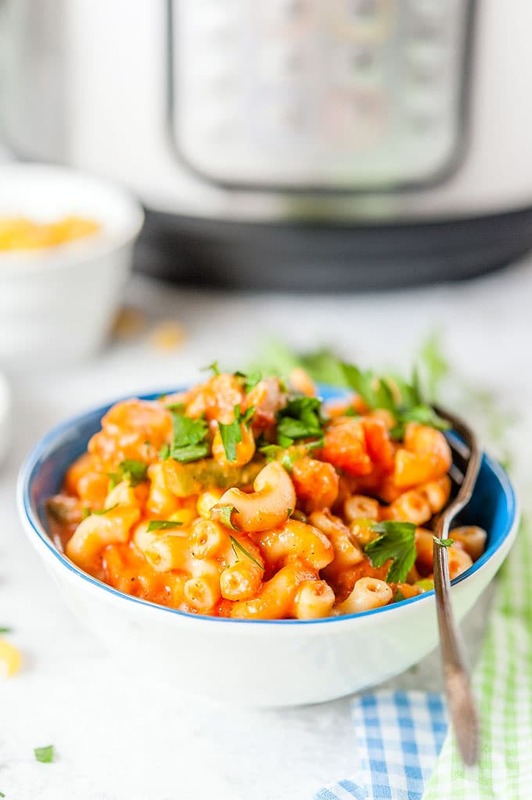 And if you’d like a delicious Instant Pot Pasta that is also creamy, vegan, and gluten-free, then check out Creamy Instant Pot Pasta with Romesco Sauce from Dana of Killing Thyme. It looks divine! I just recently ran out of my pasta stock that I got a while ago, so I went to get more. I grabbed a bag of macaroni and just as I was leaving the aisle I noticed a sign on the package: cooks in 3 minutes! Woah!! I checked another bag and another. In fact, I had to check almost a dozen of packages of various pasta shapes in order to find something that cooks in a normal amount of time. I am not sure when this trend started but at least half of the boxes and bags of pasta now cook in just 3-4 minutes. Which sounds great… kind of. Except in order for the pasta to cook so fast, it needs to be really thin. I visually checked macaroni and the package of 3 minute pasta had really thin macaroni. I am not entirely sure how the pasta would taste. It is VERY IMPORTANT to use pasta that cooks in 9-11 minutes in this recipe. TIP: The rule of thumb for cooking pasta in Instant Pot is that it cooks on high pressure in half the time that is listed on the package. You can use chicken thighs or chicken breast. I’ve used both. You can also cut up chicken into smaller pieces if you are feeding a toddler. I like macaroni because it’s easier for my daughter to eat. My husband strongly prefers fusili. Use medium-sized pasta that cooks in 9-11 minutes. For this recipe and video I used 1.5 cups of broth because I know most people prefer saucier pasta. When I make this recipe for my family, I use 1 cup broth only as we prefer our pasta to be less saucy. I always use Better Than Bouillon for broth. I have been a fan for more than a decade. Many people will say never to cook milk in an Electric Pressure Cooker. I have done this for many months and have never had any issues at all. I use 2% milk, you can use any kind. I have a feeling that this Instant Pot Creamy Chicken Pasta would be great with half-and-half also. Also known as Passata or strained tomatoes. I use Mutti brand. Veggies are totally optional here. I add them so that my daughter gets more nutrients. You can omit or use whatever your favourite kind. You can use less or more cheese. Less will obviously make this Instant Pot Pasta a bit less creamy but no less delicious. Also, you can use a different kind such as mozzarella, havarti, edam, etc. It took me a long time to like my Instant Pot. I had so many issues with it. 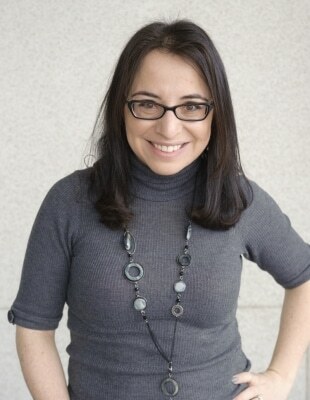 In fact, I even wrote an article about 7 Things You Need To Know About Instant Pot. One of the things that really bothered me was that Instant Pot isn’t actually instant. 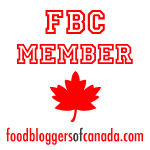 Even though most recipes and videos online make it seem like food will be ready in minutes. 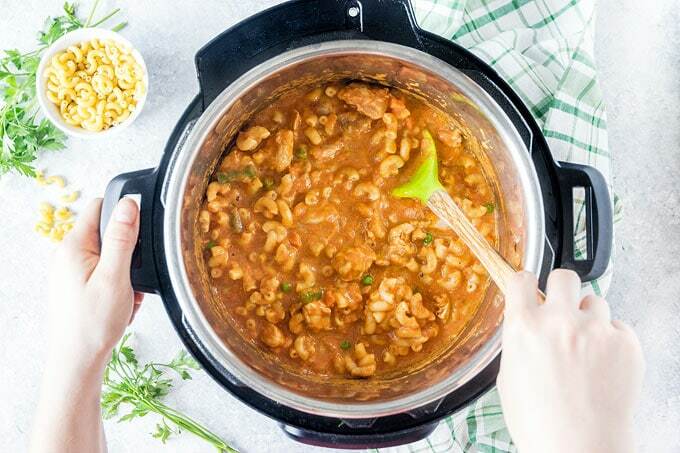 In fact, only the sole pressure cooking time is often short, however, there’s time that it takes for the electric pressure cooker to come to pressure and time to release the pressure. So, I always like to include the actual cooking time of my recipes. The last time I made this Creamy Chicken Pasta, my Instant Pot took 13 minutes to come to pressure and 2 minutes to release the pressure. My ingredients were just slightly below room temperature but not cold. Colder ingredients will take longer to come to pressure. So, with about 10 minutes of prep and light sautéing, 13 minutes to come to pressure, 5 minutes cooking, 2 minutes release, 3 minutes standing it comes to 33 minutes. 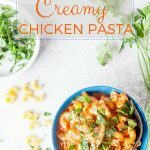 Let’s add another 2 minutes for mixing it all together and we get a delicious Instant Pot Creamy Chicken Pasta ready in 35 minutes. If you like this One Pot pasta recipe, then you need to PRE-ORDER my cookbook, The Ultimate One-Pan Oven Cookbook. I have a delicious One Pot Pasta recipe where pasta actually cooks in the oven! Magic! 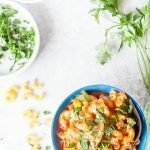 I usually make this Instant Pot Pasta in the middle of the day when my toddler naps. I give her a bowl of this delicious pasta straight out of the electric pressure cooker. Then I transfer the rest of the pasta into a casserole dish and keep in the fridge until my husband comes home. Later in the evening, I whip up a very quick topping for the casserole and bake it. NOTE: if you are going to eat this Instant Pot Creamy Chicken Pasta right away, then do follow the instructions and let the pasta sit for a couple of minutes after you stirred in the vegetables and the cheese. However, if you are turning this pasta into a casserole, then do not let the pasta sit. It’ll get the pasta too cooked and then it’ll cook even more in the oven. 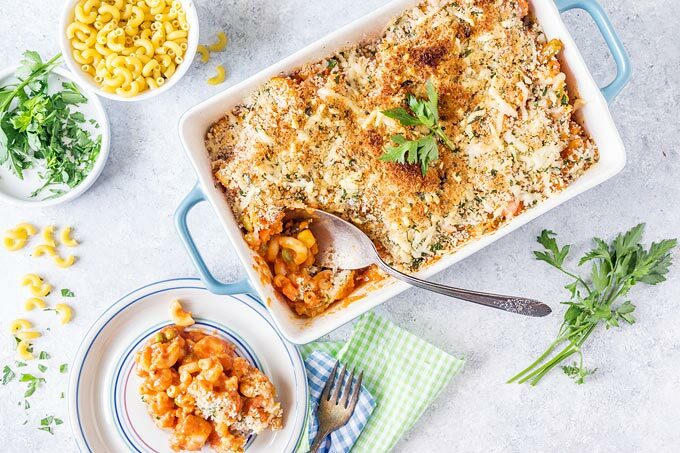 How to make casserole topping? I use 1/2 cup bread crumbs, 1/2 cup grated Parmesan cheese, 2 tablespoons chopped fresh parsley. Don’t forget to watch the video to see how easy and fast this Instant Pot Creamy Chicken Pasta comes together! Press sauté on your Instant Pot, add the olive oil and heat it up. Add the chopped onion and sauté for 5-8 minutes stirring, until the onion is translucent and starts to turn golden. Add the rest of the ingredients except for the frozen vegetables and cheese. Turn the sauté function off. Close the lid and turn the valve to sealing. Press Manual or Pressure Cooker button (depending on your model) and use the arrows to select 5 minutes. It will take about 12-15 minutes for the Instant Pot to come to pressure, depending on how cold the ingredients are. Once the 5 minutes of pressure cooking are up and your Instant Pot beeps that it's done do a manual quick release. I like putting a small kitchen towel on the pressure release valve to contain the steam a little bit. It took about 2 minutes to fully release the pressure. Open the lid, stir in the frozen vegetables if using, the grated cheese and stir to incorporate. Try to see if the pasta is cooked to your liking. It is usually just a tad too al-dente for me at this point. 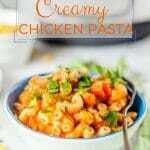 If you are serving this Instant Pot Creamy Chicken Pasta right away and the pasta is just a bit too al-dente, then close the lid and let the pasta sit for 3 minutes. If you are turning this pasta into a casserole, then transfer the a casserole dish right away. 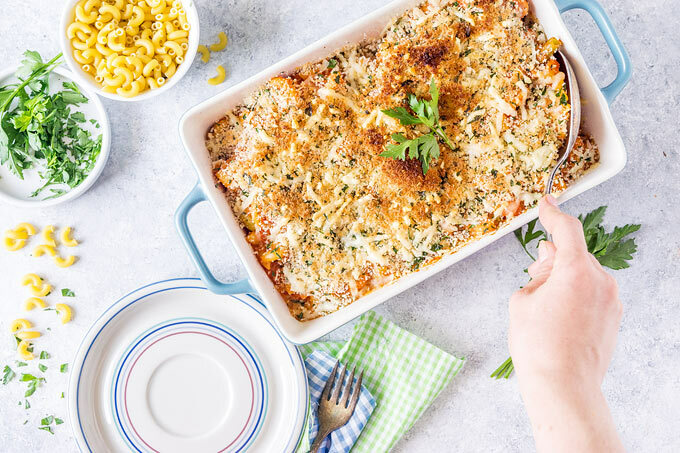 Add the toppings (1/2 cup bread crumbs+1/2 cup grated parmesan cheese+2 tablespoons chopped parsley) and broil for 3-4 minutes until the cheese is lightly golden. I prefer this pasta less saucy and usually use 1 cup of broth only. Depending on how long the pasta is supposed to cook, 5 minutes of cooking might be just right or the past could be a tiny bit too al-dente. 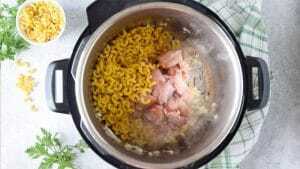 Macaroni that I have cooks in 11-12 minutes, so 5 minutes in Instant Pot is just under what I like. This is way I let the pasta sit with the frozen veggies and cheese for a few minutes. If your pasta is supposed to be cooked in 9 minutes, then 5 minutes of Pressure Cooking will be just enough and there's no need to let pasta sit with the cheese. If you are using fussili instead of macaroni then go by weight and not cups. It looks like 2 cups of fussili weigh less than 2 cups of macaroni. How would I adjust this recipe if I needed to use frozen skinless boneless chicken thighs? Hello! Thanks for the honest time recipes! I am new to instant pot but have already found some very strange recipe offerings. I am not fond of thigh meat. How would using chicken breast change the recipe? Or would it at all? Thank you! You could omit chicken altogether. You can use chicken breast instead. You can add cooked smoked sausage. I’m not sure if you can add raw sausage, most likely it’ll be cooked enough but I personally haven’t tried it so I can’t guarantee it.